Blog Update: New Recipe Page! 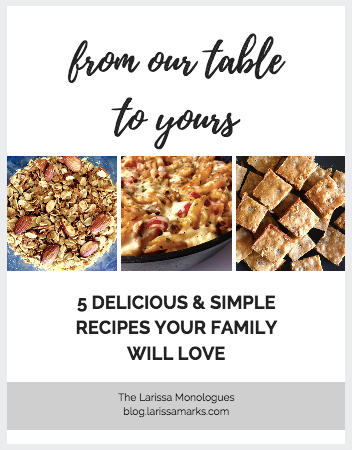 I’ve been doing some spring cleaning on The Larissa Monologues site, hoping to give it a simpler look and make it more user friendly. I also created a new feature, a Recipe page, where you can find every recipe organized into categories. You can browse by categories such as Desserts & Sweets, Family Favorites, or Local Hawaiian Cuisine. Or you can simply use the search feature to look for recipes by keywords. Now it’ll be easier to find recipes around here. Yay! While I indexed recipes, I had a few revelations. The birth of my blog coincided with when I first started to love cooking. I suppose me posting recipes and kitchen endeavors on the blog makes sense since they began at the same time. The very first recipe I ever posted was Slow Cooker Kalua Pig, which continues to be one of my all-time favorites. Lemony Lemon Bread, Haupia Squares, and Chewy Ginger Molasses Cookies are the most searched for recipes by readers. There is a severe lacking of salad recipes around here. But lots of chocolate desserts and sangria. Those are obviously the most important food groups. I swear by your blondies recipe, it's one of my favorite desserts to bake!